Here is a recipe that I developed based upon a few recent experiments in the kitchen. The result is a cheap, easy, healthy, fast, and filling dessert. Microwave the apple much like you would “bake” a potato. Poke holes in it with a fork, and then loosely double-wrap the fruit in saran wrap. There is no need to core the apple, as the baking process will soften the entirety of the fruit. 5-7 minutes should do it. 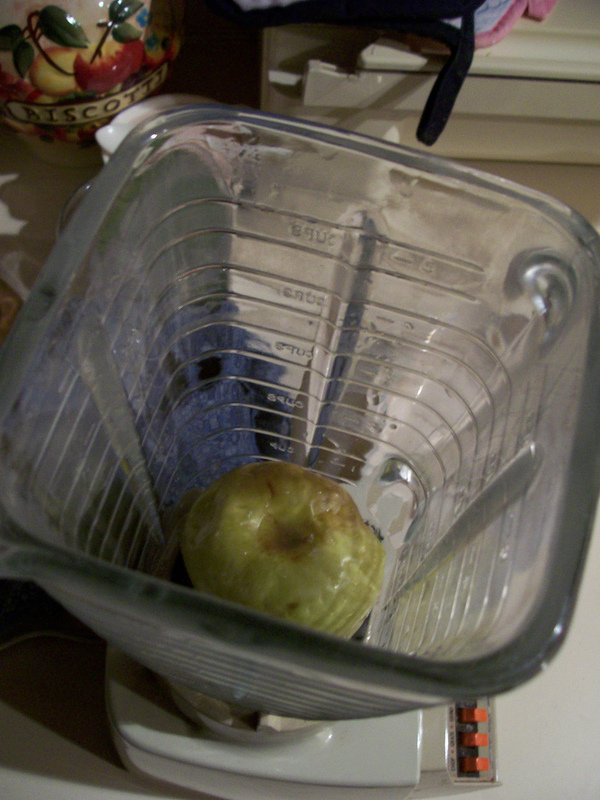 Place the fruit in a blender or food processor. Add Splenda, milk (I used skim), and 1/2 Cup Wheaties. Blend briefly so that the mixture remains chunky but well-mixed. Don’t blend too much, or you will end up with baby food (which is still good, but fairly unnecessary). Pour this mixture into a bowl. Stir in 1 cup Wheaties. 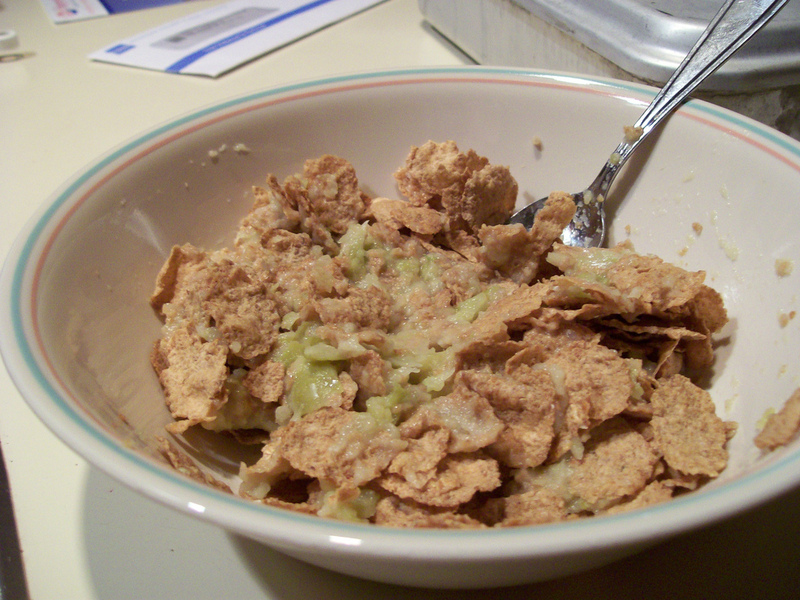 Sprinkle cinnamon atop the “apple crisp.” Bon appetit! 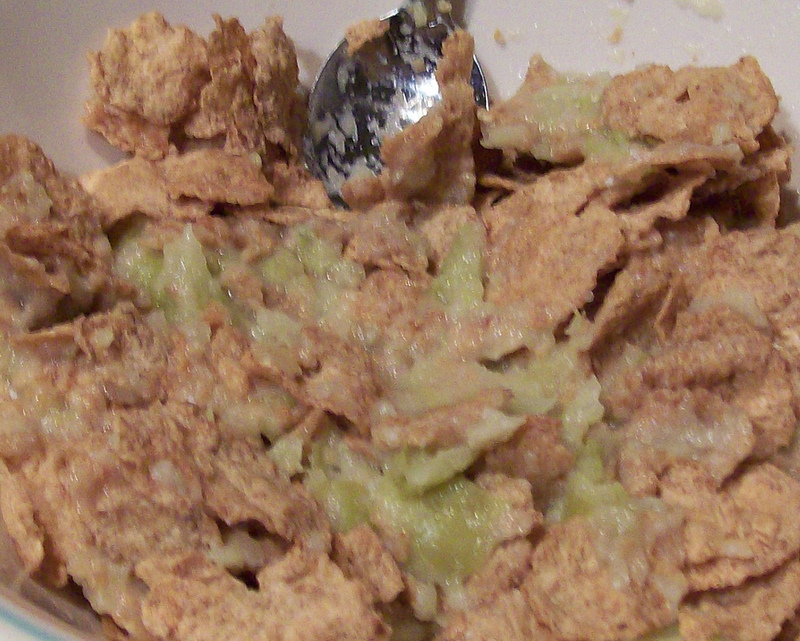 Suggested serving: cover in 1/2 cup milk while still warm, and scarf it down while it’s still crunchy! Look at the pictures! And you thought I was joking with the “Ugly Food” thing! If you don’t want to use the Splenda–which may destroy your insides with its sweet chemical goodness–you can replace it with sugar, or replace the Wheaties with Frosted Flakes. This “dessert” can also function as a breakfast. It’s essentially just a bowl of cereal with fruit and milk! A little creativity can turn your boring old whole-grain breakfast-of-champions into a special treat.